Actress Anneke von der Lippe has become the first Norwegian to win an Emmy Award from the International Academy of Television Arts & Sciences. Von der Lippe won the prize for Best Performance by an Actress for her role as a police investigator in the NRK series Øyevitne (Eyewitness). “I can’t manage to think much right now, I’m just terribly glad,” she told Norwegian Broadcasting (NRK) after the award was announced at the 43rd International Emmy Awards ceremony in New York Monday night. Von der Lippe beat out the two other finalists, British actress Sheridan Smith for her role in the TV series Cilla, and Fernanda Montenegro, for her role in the Brazilian TV series Doce de Mae. 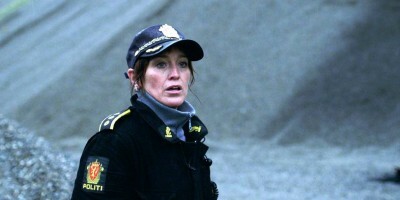 Her victory came for her role as police investigator Helen Sikkeland in the popular NRK crime series Øyevitne. Von der Lippe isn’t only the first Norwegian but also the first performer in all the Nordic coutries to win an Emmy. “It is recognition of another world,” von der Lippe told NRK: “It’s really a milestone.” She hopes it will further boost interest in Norwegian TV drama series and, on a more personal note, her own career as well. NRK reported that she has had some interest in working as an actress internationally. Congratulations were pouring in to von der Lippe all day, including from Norway’s Culture Minister Thorhild Widvey, who called the Emmy Award “a great acknowledgement” of von der Lippe’s work. She’d been nominated before, in 2005 for her role in the TV series Ved Kongens bord, in which she played a government minister herself. Her role as a police investigator in Eyewitness pitted her as female law enforcement officer in a small town against the “big boys” in the Oslo Police District. The 51-year-old actress grew up in Oslo, has been employed by the National Theater in Oslo and also has performed on stage in Bergen and at the Rogaland Teater in Stavanger. She’s also performed in several Norwegian films.